To grow the highest quality turf while striving to surpass our customers' expectations of service. Valley Sod was established in 2001 with the merger of 2 farms, bringing together over 30 years of sod production experience. Over the years the acreage and varieties have increased so that our markets now include southern Nevada, southern Utah, and Northern Arizona. With emphasis on product quality and service we will continually strive to be the best in the industry. Valley Sod has over 450 acres of active growing turf in different stages of maturity. 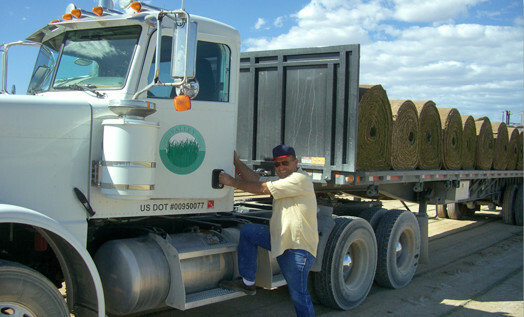 We harvest orders 6 days a week for deliveries throughout southern Nevada, southern Utah and northern Arizona. Sod is harvested in 5 square foot pieces with 100 pieces per full pallet or in 300 square foot big rolls. Our drivers make deliveries on flatbed trailers with attached forklifts which allow them to locate the sod as close as possible to where it will be installed. 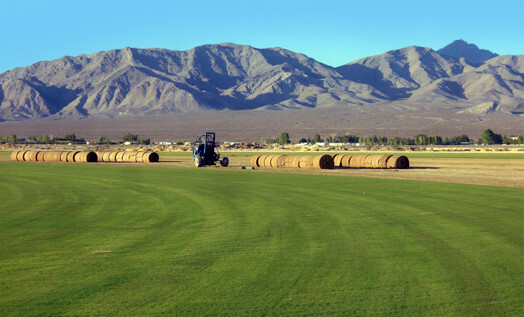 Organics are at the root of the quality sod grown at Valley Sod Farms. We feed the soil with rich organic materials which in turn break down to provide nutrients to the turf. Although our turf is not 100% organically grown, organic materials play a big part in the growing of all of our turf varieties. Shipments for next day delivery must be received by 11:00 a.m.
2009-2019 Valley Sod Farms, LLC.